There is not a person out there that would argue that the Chicago Blackhawks had a terrible season in 2017-18. It started off great with a pair of dominant wins over the Pittsburgh Penguins and the Columbus Blue Jackets, but things spiraled quickly when it started to become clear that Corey Crawford was working overtime to plug a bevy of holes in the beat up dinghy masquerading as their blueline. In the span of a couple of years the Blackhawks blueline has gone from an unsinkable ship to the SS Minnow. Things went further off the rails when Crawford went down with an injury (his second of the season) in late December that would keep him out for the remainder of the season. Now, if the team had been able to maintain a playoff spot, there is a chance Crawford may have found a way back into the lineup. Unfortunately, the ship was sinking and rolling with Crawford wouldn’t have salvaged the season. Of course, the temptation would have been to bring Crow back as soon as possible, but with head injuries, coming back too soon can have long-term adverse effects, and it just wasn’t worth the risk even if he could have helped his team cling to a wildcard spot. Crawford was dealing with an injury that would only benefit from more time away from the grind of an NHL regular season, so the wheels coming off the cart may have been a blessing though it hardly felt like it. Without Crawford, the team simply couldn’t keep their heads above water with a transitioning blueline, a handful of inexperienced netminders and a group of forwards that never seemed to find their stride. The season was clearly going to be a wash before the calendar even turned to 2018. Obviously, the plan is for Crawford to retake the net at the start of the 2018-19 season, but there has been little if any positive news regarding his return, and there is no guarantee that the Crawford we saw last season would be the Crawford we’ll see when he does return. So, expect some changes to come behind him because the Blackhawks need to be better prepared in the event that Crawford’s workload needs to be pared down, or worse. Anton Forsberg had some good moments, but it became clear early that taking over the top slot was not in his wheelhouse just yet. While there is a chance he could fight for a spot as backup next season, it seems more likely that he’ll be on the move and looking for a fresh start elsewhere. What the Blackhawks had in the arsenal last season was not good enough. Sure, there were some interesting stories with Jeff Glass making his debut at 32 years old, and accountant Scott Foster making his NHL debut as an emergency backup in the middle of tax season, but beyond that, the goaltending was cringeworthy more than it was awe inspiring. Sure, there were bright spots. Pint-sized phenom Alex DeBrincat (5′ 7″, 165 lbs.) shined the brightest in his rookie season leading the team in scoring with 28 goals and 24 assists. Everyone knew he was going to be special, but no one really expected him to lead the team in scoring over Patrick Kane. Raise your hand if you had Alex DeBrincat as the #Blackhawks leading scorer at the start of the season. Put your hand down, you liar. The Cat scored his first of three hat tricks just ten games into the season. Now if only we could get a good look at Kane and Debrincat on a line together. The 2018 IIHF World Championships showcased what the pair could do together, and fans will no doubt be looking for a longer look when the 2018-19 season kicks off. It was understandable (and also at times frustrating) that the Blackhawks and coach Joel Quenneville wanted to shelter Debrincat from the tough defensive pressure that goes along with being Kane’s linemate. However, when nothing else seemed to be working, that looked like the new nuclear option, and it was one that didn’t get more than a few passing glances. If nothing else, it might have been a glimpse of something positive in a season that was pretty lackluster across the board. Nick Schmaltz was another bright spot. He added 15 more goals and nine more assists to his totals from the previous season finishing with 21 goals and 31 assists. That’s the kind of improvement that the Blackhawks needed to see from the young forward. He even spent some time anchoring Kane’s line with a variety of players slotting in to his left, and it wasn’t terrible, though there is still a lot of room for improvement on the dot. Schmaltz improved his numbers on the dot by about 10 percent to just over 40 percent, but that’s a number that the team would like to see above 50 if he’s going to stick as the pivot on Kane’s line. However, Schmaltz certainly did enough to prove that he has legitimate chemistry with Kane and it is likely that he will find ways to stick on that line regardless of whether he is the triggerman or on the opposite wing. Kane also had a solid season, but the rest of the team struggled mightily with Jonathan Toews and Brandon Saad having extremely disappointing seasons. The good news is that there is every reason to believe that Saad’s performance was an anomaly and that he will come back next season with a big chip on his shoulder, provided Stan Bowman doesn’t pull the trigger on another trade. It could happen, but it seems more likely that the Blackhawks would stick with the big power forward and hope that he looks more like the player they traded away a few years back in 2018-19. Bowman would have to net one heck of a trade to make it worthwhile and let’s be honest, Saad’s trade value isn’t what it was after winning a Stanley Cup in 2015. A rebound would change all of that, but it would also likely cement his place in the Blackhawks’ future plans. A future that never should have been traded away in the first place…but that’s another argument for another day. Toews is harder to gauge, like Saad his numbers were down, but they’ve been declining in recent years, and while it’s possible he improves in the upcoming season, it is also possible that time and excessive mileage are starting to catch up to the captain. Only time will tell, but for Toews, motivation has never been his downfall. He’ll do everything in his power to come into the new season ready to prove his best days are not behind him. Saad came up in the league with Toews and Marian Hossa, and he appears to be cut from the same cloth. It didn’t help either player that they were without Hossa for the duration of the season. His absence negatively impacted both of their games as they were forced to take on even more responsibility. There are no numbers that can adequately display Hossa’s value as it pertained to Toews and Saad, but his presence allowed both to play a little more freewheeling style knowing that 81 would execute flawlessly in whatever role he had to play at any given moment. Without him, the pair had no choice but to tighten up and it showed. The solution is a tough one because they will inevitably have to give something up to get a different result in the upcoming season. Saad and Toews both need to get back to playing the way that has made them successful in this league, and they will have to find ways to do that without their preferred wingman as Hossa will not be returning to the NHL. Saad needs to crash the net and muscle the puck as he did when he earned the nickname ‘mini-Hossa.’ And Toews will more than likely be forced to either give up a little of his defensive game to get his offensive game back on track or accept that his role has changed and grind it out while a new winger picks up some of the scoring slack. Whatever Toews does, his legacy depends on it. We’ve all heard that Chicago runs on Duncan, and we know the team is at it’s best with Crawford between the pipes, but Toews is the captain and as he goes, so goes this team. He is the lynchpin. If he bounces back, the team will likely rise with him, but if he falters, so shall the team and it very well could be the beginning of the end of the Blackhawks we’ve been watching since 2007. They will never be as dominant as those early teams, but if they have any hope of recapturing some of that magic it begins with the Captain. At 30, there is no reason to believe that Toews can’t return to form, or at least improve on his numbers from the previous two seasons. And he is still the strongest triggerman the Blackhawks currently employ which should not be underestimated as he sits at 58 percent (a three percent improvement over 2016-17). Schmaltz should continue to improve (40 percent), and David Kampf certainly showed some promise in his rookie season (53 percent), but Artem Anisimov (45 percent) is unlikely to be lining up behind Toews next year as he is almost certain to be trade bait. Whatever complaints there are about Toews, he’s still vitally important to this team, because there is absolutely no alternate universe where chasing the puck on lost faceoffs all night wins a ton of hockey games, and leadership still counts for something. Toews has earned a little latitude from the fanbase with a long list of clutch performances, and something tells me he has a little something left in the tank. He’s a competitor through and through, so expect him to fight to carry his team back to the playoffs next season. The Blackhawks blueline took a beating this season, and it saw a slew of new faces. Some made an impact and others fell flat, but no one blew the doors off the place. Brent Seabrook is the Ghost of Christmas past. He cast a big shadow, but he did little to dispell the ominous ghost of what is yet to be. Time has hampered the big defender, and while he still had some good nights, they were easily overshadowed by rough outings. In fairness, Seabrook’s decline has been evident for several seasons and were it not for the anchor that is his current contract ($6,875,000 through 2023-24) that might not be quite the anxiety-inducing horror that it currently is. Sadly, he consumes cap like those pesky little ghosts pursue Super Pacman, and right now it’s creeping up on the Blackhawks who are already inching ever closer to their last life with no quarters left to play. Seabrook even saw a game from the press box, which is a day most Blackhawks fans thought they’d never see. In fact, the entire blueline was treated to a night (or several) in the nosebleeds with one exception. But even he is starting to show a little wear on the tires. His production levels sank like the Titanic with his first goal coming all the way in mid-February, and he will likely never get back to the Norris Trophy caliber play of the past, but Keith’s skating, overall fitness, and his ability to read the game undoubtedly give him a much better chance to adapt to the reality of time in a way that Seabrook can’t. Keith for his part is always going to have some value as long as he is on the ice and continues to skate as efficiently as he does. Sure, he may be slowing down, but his slick skating, freakish endurance, and hockey IQ should help him outrun time for a little while longer. However, it would help him tremendously if the revolving door of defensive pairings slowed down a bit. A true number two defenseman could help Keith get back to the game Blackhawks fans have come to expect, and trimming down his ice time would also be beneficial provided the blueline finds some much needed stability over the summer. The Blackhawks have a glut of defensemen signed heading into next season, but it remains to be seen whether any of them are the solution to the Blackhawks woes. I’m going to go with not quite, but we’ll get into that a little later this week when we start looking at solutions that might help the Blackhawks keep history from repeating. Connor Murphy has been hearing his name whispered about the rumor mill and could wind up playing in another new city. Since coming in last summer in the trade that sent Niklas Hjalmarsson to the desert, Murphy has shown some promise, though he came in with an impossible to fill set of skates before him. Hjammer is and always will be irreplaceable. The comparison is apples to oranges, and rather unfair but it was bound to happen under the circumstances. 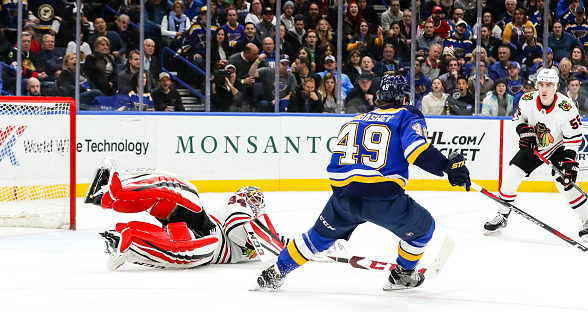 Murphy’s game did show improvement with Chicago in spite of their faceplant this past season, and is certainly worth a second look should he stick around. Murphy has been on Bowman’s radar from his time with Team USA, so it wouldn’t be a shock if the rumors remained just that. Jan Rutta and Gustav Forsling also had some glimpses of promise as a shutdown pairing that was moderately successful midway through the season, though injuries derailed their progress a bit and saw Forsling return to the AHL’s Rockford Icehogs. Jordan Oesterle also looked like he could be a good fit, and even stuck with Keith for a stretch without looking like an anchor tied around his waist. All three will have to show some growth coming into next season, as it seems like a good bet that they will have some new faces ready to challenge them for their spots. Erik Gustafsson came up late in the season and showed some growth from the previous season earning a new contract as well. Cody Franson was not the answer as he finished the season in Rockford. Apparently, neither was Michal Kempny who is currently playing for the Stanley Cup with the Washington Capitals. It’s quite amazing what a longer leash can do for a defensemen. While all of the blueliners had some moments that were disheartening, it is hard not to look at the coaching staff and wonder if all of the healthy scratches and revolving doors didn’t hamper the whole lot of them to some extent. Everyone will need to be better, but a little stability might go a long way towards helping the young players find their footing as Kempny has, and it probably wouldn’t hurt the veterans either. Whatever happens, there are too many defensemen and not a number two among them, so a change is coming. Blackhawks fans have been spoiled since Kane and Toews landed in Chicago effectively wedging their hockey sticks in the Cup window for over a decade and battling their way to three Stanley Cups. The team that hit the ice last season was a disappointment for the fans, but it was undoubtedly a much bigger disappointment to the players who put their blood, sweat, and tears into every shift. That was not the season that they wanted and one thing you can never say about this team is that they lack heart. You don’t get to the top and stay there for the better part of a decade without being able to overcome adversity. This team will look different next season, but with a couple of key moves, there is every reason to believe that different can also be better. Only time will tell if those sticks can still hold the window open for another run (or two) before 19 and 88 hang them up. But, a little young talent and some fresh legs on the back end along with a healthy Crawford will give the fans a lot more to cheer about in 2018-19. Stay tuned for part two where we’ll take a look at some of the picks, prospects and free agents who could find their way to Chicago during the offseason.